Space station commander Scott Kelly and newly-arrived flight engineer Tim Kopra ventured outside the lab complex Monday and freed up a stalled robot arm-carrying transporter so it could be safely moved to a nearby anchor point and locked down, clearing the way for a Russian Progress supply ship to dock Wednesday. The quickly-planned-and-executed spacewalk began when Kelly and Kopra, floating in the Quest airlock compartment, switched their spacesuits to battery power at 7:45 a.m. EST (GMT-5), less than four hours after the Progress MS/62P cargo ship blasted off from Kazakhstan to kick off a two-day rendezvous with the station. Loaded with 5,753 pounds of propellant, supplies and equipment, the Progress is expected to dock at the space station's Russian Pirs module around 5:31 a.m. Wednesday. Last week, NASA flight controllers uplinked commands to move the robot arm's mobile transporter, or MT, from work site 4 to work site 2 on the forward face of the station's long power truss. But after moving just four inches or so along its rails, the MT stalled and refused to budge. The MT must be locked down when the Progress docks at the Pirs module to avoid possible damage from vibrations transmitted through the station's structure. But the MT can only be locked down at one of the work sites on the power truss. Engineers suspected the brakes on a crew equipment and translation aid -- CETA -- cart attached to the transporter somehow engaged before the attempted move from work site 4 to work site 2. 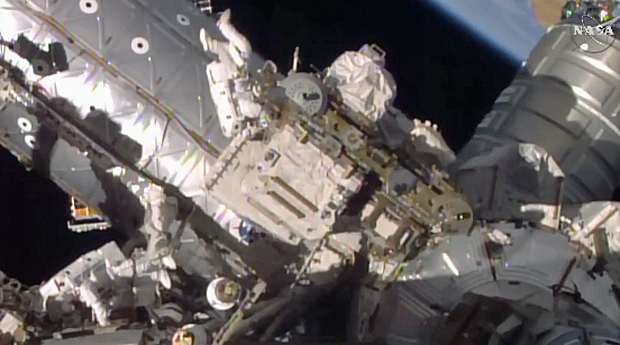 During a spacewalk Nov. 6, Kelly tied down a brake handle on the starboard CETA cart to minimize potential interference and it's possible the handle somehow slipped out of the unlocked position. During an initial inspection Monday, Kelly reported the starboard CETA cart refused to budge when he attempted to rock it back and forth. Then he disengaged the cart's brake. "It's moving now," he reported. "I hit it twice, I think that fixed it. That was pretty easy." "OK, Scott, so we just want to verify, when you said movement, you're feeling movement in the CETA cart itself?" asked astronaut Mike Hopkins in mission control. "Yeah. As I did that, it started moving forward and aft," Kelly replied. A few minutes later, after making sure both CETA carts were free on the mobile transporter's rails, a flight controller in Houston uplinked commands to move the MT back to work site 4. "I see motion," Kelly reported as the MT inched along. A few moments after that, Hopkins reported: "Good news, it appears to have reached the work site center." That cleared the way for additional commanding to lock the mechanism in place, completing the primary objective of the spacewalk. Kelly and Kopra then carried out a few "get-ahead" tasks. Kopra opened up access doors to facilitate replacement of avionics boxes as needed in the central S0 truss segment and laid out an ethernet cable needed by a future Russian laboratory module. Kelly continued work started earlier this year to route power cables needed for a new docking mechanism that will be installed next year. "Make sure you look at the Earth," Kelly advised Kopra at one point. "Yeah. Good point," Kopra replied as the space station approached Europe, 253 miles above the Atlantic Ocean. After completing the get-ahead tasks, both men returned to the Quest airlock. Repressurization began at 11:01 a.m., bringing NASA EVA-34 to an end at the three-hour 16-minute mark. "I just want to say thank you to everybody up there, great job," Hopkins radioed. "You turned around an EVA in three days, so well done. There are a lot of smiling faces down here." "Hey, thanks to you guys," Kelly replied. "This is a team effort. We're just the guys who are really just lucky enough to be going out here. It takes all of us to get this job done. So we much appreciate your help." This was the 191st spacewalk since station assembly began in 1998, the seventh so far this year, the third for Kelly and the second for Kopra, who arrived at the station last week aboard the Soyuz TMA-19M ferry craft. Total station EVA time by 122 astronauts and cosmonauts representing nine nations now stands at 1,195 hours and 20 minutes, or 49.8 days. The Progress MS/62P cargo ship, launched from the Baikonur Cosmodrome in Kazakhstan at 3:44:39 a.m., is the first in a new series of spacecraft featuring an upgraded command and telemetry system, new digital video gear for proximity operations and additional redundancy in a manual control backup system. MS-series upgrades tested on previous flights include an improved KURS rendezvous radar, an upgraded satellite navigation system, redundant motors in the docking mechanism, improved shielding against micrometeoroids and a new LED spotlight. The Russians originally planned to launch the first MS-series Progress earlier and to implement the upgrades in a piloted Soyuz spacecraft in March. But the April 28 loss of a Progress due to a third stage malfunction delayed implementation and triggered downstream adjustments to the Russian launch schedule. The Russians now plan to launch two MS-series Progress supply ships -- the second is scheduled for launch March 31 -- to flight test the new upgrades with the first Soyuz MS taking off on June 21. On board will be spacecraft commander Anatoly Ivanishin, Japanese astronaut Takuya Onishi and NASA astronaut Kate Rubins. The crew that originally planned to launch aboard the first MS-series Soyuz in March -- Oleg Skripochka, Alexey Ovchinin and NASA astronaut Jeffrey Williams -- was switched to an older Soyuz, the TMA-20M. The Progress MS/62P spacecraft launched Monday is the tenth space station supply ship launched this year. The April Progress failure and the June loss of a SpaceX Dragon cargo craft cut into the station's on-board reserves, but four cargo ships in a row have reached the outpost since then and the fifth is now on the way. The MS/62P supply ship is carrying 1,918 pounds of propellant, 105 pounds of oxygen and air, 926 pounds of water and 2,804 pounds of equipment, crew supplies and spare parts.